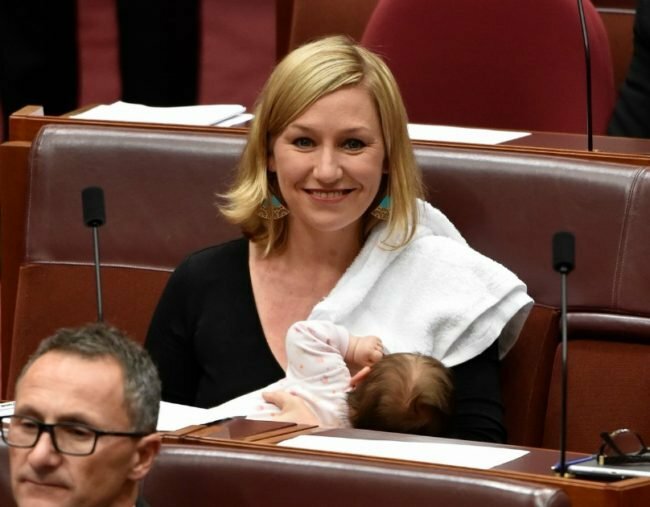 Breastfeeding in senate: Larissa Waters is the first Australian politician. Larissa Waters has made history by breastfeeding in the Australian Senate. Today, Queensland Senator Larissa Waters has made history as the first politician to breastfeed her baby in the Australian Senate. This is the senator’s first week back in parliament after giving birth to her daughter Alia Joy, who is 11 weeks old. “So proud that my daughter Alia is the first baby to be breastfed in the federal Parliament! We need more women and parents in Parliament,” Waters posted to Twitter this afternoon. Although raising a baby, as well as being the Deputy Leader of the Australian Green, has it’s “challenges”, the 40-year-old senator told Mamamia she feels lucky to be able to work with her daughter by her side. “The challenges range from managing sleep deprivation and needing to feed bubs at times she wants – like while doing a radio interview or voting in the Chamber – to the logistical issues of needing multiple nappy and sleep stations at both homes and offices,” she said. Breastfeeding has been permitted in the chamber since 2003 but, last year, Waters extended these rules to encompass &apos;caring for an infant&apos; in general. "As any working mum knows, it’s really hard to balance all your responsibilities – but you do your best," Senator Waters said. Adele discusses breastfeeding at her concert in London. Post continues below. Waters&apos; partner Jeremy Gates was also in the chamber. He has taken time out of running his digital marketing agency to be a full-time dad and was minding Alia while Waters was preparing a 10-minutes speech. During this preparation, it was clear she was needed for other duties, too.